Because everyone needs a break now and then, Reel Toronto is going on temporary hiatus. Here is one of our favourite instalments, which originally ran on January 3, 2008. Toronto is cheaper to film in than Boston. How do you like them apples? Good Will Hunting does it right. See, some movies (like Blues Brothers 2000) think they can fool you and save a few bucks by shooting in Toronto and throwing in a few skyline shots of the purported actual location—but it doesn’t work. This flick, on the other hand, manages to blend Toronto and Boston scenery so seamlessly that you might not even realize huge chunks of the film were shot outside of Beantown. A sharp eye, however, reveals the many locations the Oscar-winning flick took advantage of here in the 416. Take the school, for starters. 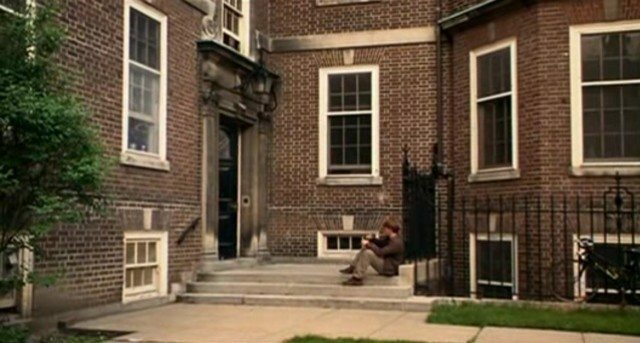 Good Will Hunting has many scenes set at Harvard and MIT, but our own U of T fills in for both quite nicely. 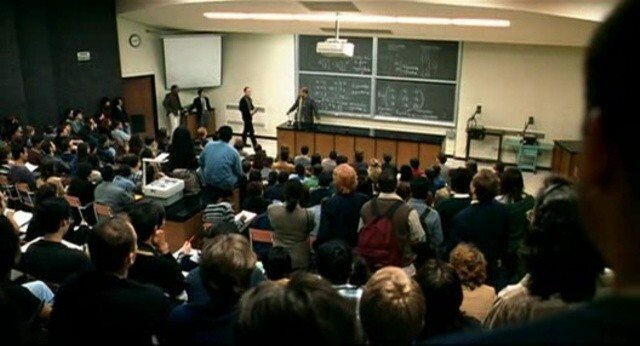 The lecture room in which Stellan Skarsgård teaches, for example, is actually at the McLennan Physics Labs on St. George. Loitering outside the residence is not encouraged unless you are a math genius of some kind. Other academic-type scenes were shot at St. Mike’s, the Faculty Club, Victoria College, and the ever-picturesque Knox College. Nearby Central Tech was also used for some shots. 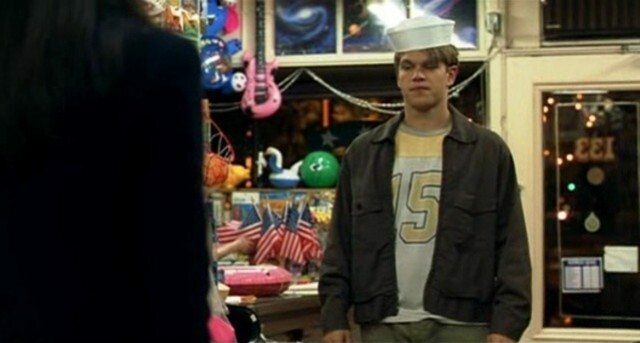 Any date that involves Matt Damon in a sailor hat can't be bad. Remember: the more prominent the Stars and Stripes, the less likely the scene was shot in the USA. 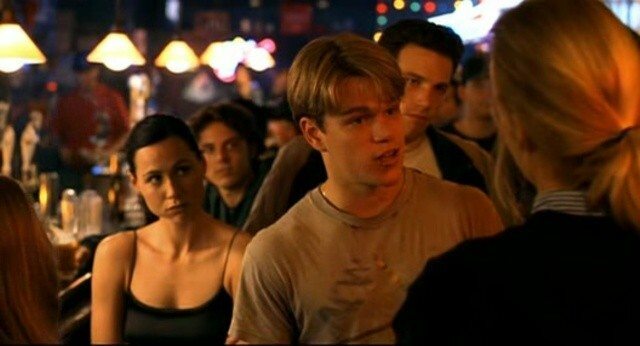 But the biggest of the TO-shot scenes is the one in which Will schools a snotty preppy dude in a Harvard bar. Perfectly parodied in Jay & Silent Bob Strike Back, the “How do you like them apples?” scene was actually shot at the Upfront Bar & Grill on Front Street. Fever Pitch, another Boston-set film also shot scenes there. An unusual accoutrement for a Toronto bar—a neon Boston Red Sox logo—still hangs in the window as a souvenir of the shoots. Affleck was the bomb in Phantoms, and this scene. The stoic Crown Life building on Bloor Street East at Church Street provided the interior for the scene in which Will’s friend, Chucky, represents him at a job interview. So there you have it. It turns out there is, in fact, a way to set a film somewhere else, shoot in Toronto, and not embarrass yourself by giving the secret away. And if you’re really lucky you can get some good mojo and score a couple of Oscars in the process.